The Miley Legal Group works diligently to ensure that your personal injury claim, whether through a car wreck, truck accident, slip and fall, dog bite or even a defective product case, is reviewed for EVERY potential recovery source. The Tiger Advantage provides you with a peace of mind when it comes to your claim. Our attorneys work hard to ensure that you receive the maximum recovery possible, whether through a settlement or a hearing in court. What is the Tiger Advantage? Injury Assessment: Because The Miley Legal Group only handles personal injury claims, the attorneys at our firm have the experience to evaluate your injuries and assess what would be a fair recovery under the circumstances. Insurance companies have the goal of settling your claim for the lowest amount possible. Our attorneys utilize the tools and resources we have available to ensure that your claim is not undervalued. Additional Insurance Sources: The Miley Legal Group understands that most insurance companies and defendants will not come forward with full and complete insurance information. A normal personal injury firm will grab the “low hanging fruit,” but The Miley Legal Group will go after all that is available. Most insurance adjusters know that when we accept a case, we will not stop until we have all the information we need to resolve get the best results possible. Claim Comparison: Most other law firms don’t have the combined experience to look at past cases and their results. The Miley Legal Group has years and years of experience with thousands of compiled cases. Cases that we have taken have been tried and/or settled in numerous counties throughout West Virginia. We always have an idea of what your case is worth, but we don’t stop there. The attorneys at The Miley Legal Group will review claims similar to yours to ensure that you receive top dollar for your claim. The Miley Legal Group has worked hard to put together a system that not only allows you to recover from your accident and return to a normal life, but to ensure that you are compensated to the fullest extent. 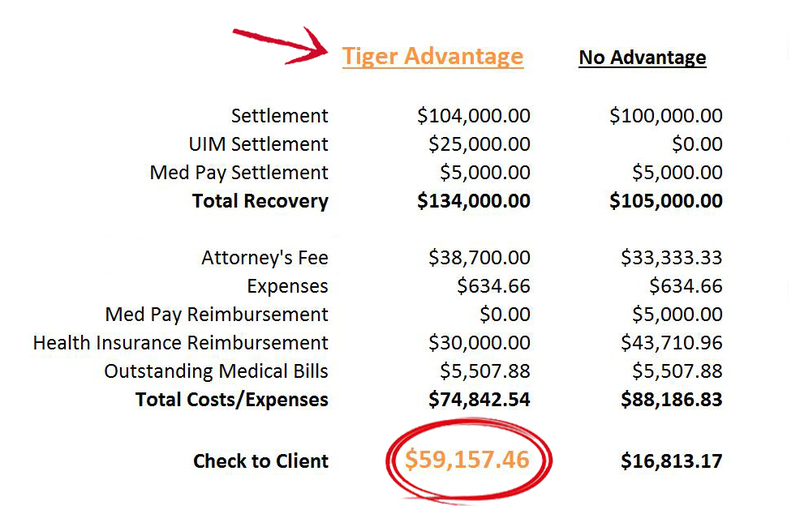 Make sure your injury claim has the Tiger Advantage, don’t leave money on the table.